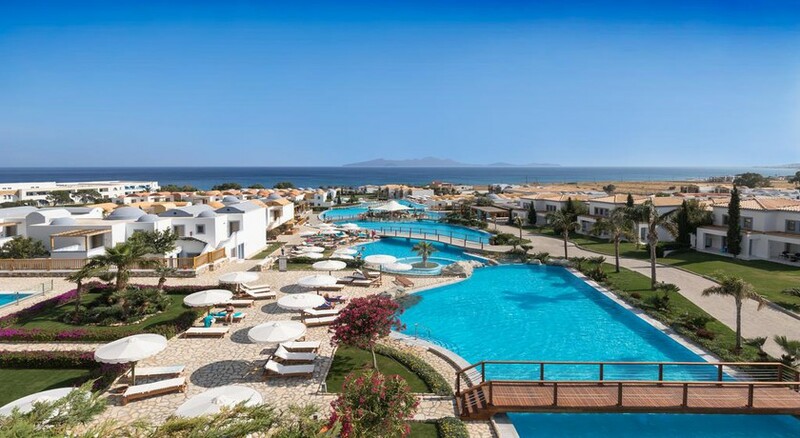 Set in an ideal seafront location, the Mitsis Blue Domes Resort & Spa in Kardamena offers a place where families can relax and couples can get away from it all and relax in beautiful coastal surroundings. It has an extraordinary range of facilities including a 650-metre sparkling pool and various restaurants and bars to suit every palate. Kids will be spoilt for choice too, with a wide range of facilities including a spa, gym, fantastic restaurants and kids club. The resort is popular for its leisurely facilities, superb cuisine and 499 beautifully furnished guest rooms that includes villas, family rooms and maisonettes. Guests can discover numerous shop, bars, and restaurants while on their walks to the beaches and fishing villages. Overlooking the golden beach, the pretty complex is a wash of white and blue building, low-lying to make the most of those gorgeous Greek views. The Mitsis Blue Domes Resort & Spa is 5-star plus hotel nestled at the foot of Mount Dikeos and overlooking a sweeping beach. The hotel is approximately 28 km from the Port, 10 km from the Kos Airport and 5 km from Kardamena Town. All 499 guestrooms are luxurious and soundproofed. The rooms include 235 pool or Sea View Bungalows, 114 Double Rooms with views of Sea, 65 Double Rooms having access to individual pool, 48 Family Rooms. There are also 32 Maisonettes, three villas and two suites for those who seek more privacy. This accommodation comes fully air-conditioned with individual control/heating; bathrooms with bathtubs and showers, hair dryer, bathrobes and slippers; direct dial telephone; mini bar; satellite TV with international channels/music channel; balcony/terrace; safe deposit box; internet connection (with a 10-euro returnable deposit); 16 hours’ room service; and a welcome basket with bottled wine and fruits. The hotel boasts a main dining restaurant with show cooking, and ten other dining options including Greek, Asian, Italian and Mexican restaurants, plus several other food & beverage outlets scattered around the resort. Six lively bars are on site to enjoy interesting cocktails. It also offers a 24-hour all-inclusive service. 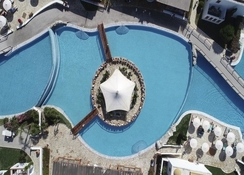 Mitsis Blue Domes Resort & Spa has a huge 650-meter swimming pool and goes through the hotel creating 12 salt water pools, with comfy sunbeds and umbrellas by each swimming pool, meaning there’s plenty of space to have splash-tastic fun in the sun. Other facilities include tennis, table tennis and football courts. For adrenaline junkies, there are some additional paid activities such as water sports, horse riding and go-karting. There is a team of entertainers to keep your kids busy throughout your stay, so you can find some time to simply relax. Or step into the Sapphire Spa for a rejuvenating therapy. Not only this, whisk your kids away to Mitsis Wonderland that includes a pool, waterslides and playgrounds. Great place to visit with a toddler, spotlessly clean, lovely food, great pools and beach - a perfect week away.